Today the Dead Sea has shrunk to modern historical lows of 1400 feet below sea level. The Sea of Galilee is itself 700 feet below sea level. 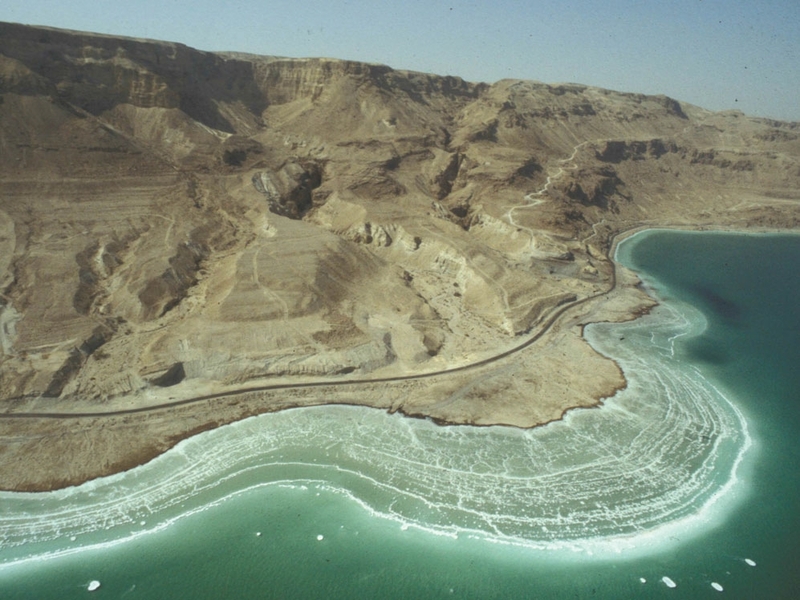 Residents of the Middle East today are concerned with how much more the Dead Sea will shrink. But what about an important geological question: has there ever been a time when the Jordan Valley was filled with water? If so, how high could the water go? 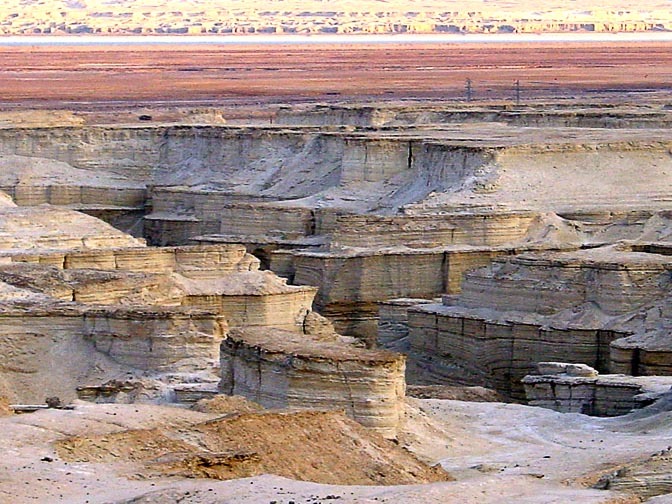 Extensive research on the history of the Jordan Valley has established that there was certainly a time when the Dead Sea was much higher than it is today or at any time in recorded human history. 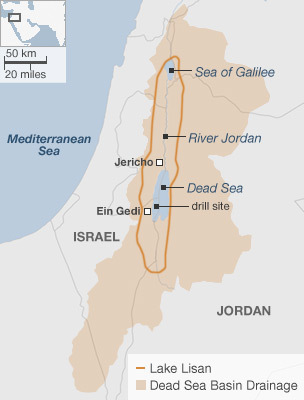 In fact, at one time the water in the Jordan Valley was at the same elevation as the Mediterranean Sea and even connected to it. How long ago was this? What did the lake look like? Did those waters leave anything behind? These are questions we are going to answer today as we continue our examination of the origins of the Dead Sea and what those origins can tell us about the age of the earth. The Valley of Jezreel is a depression caused by faulting and at one time connected the Mediterranean Sea with the Jordan Valley. 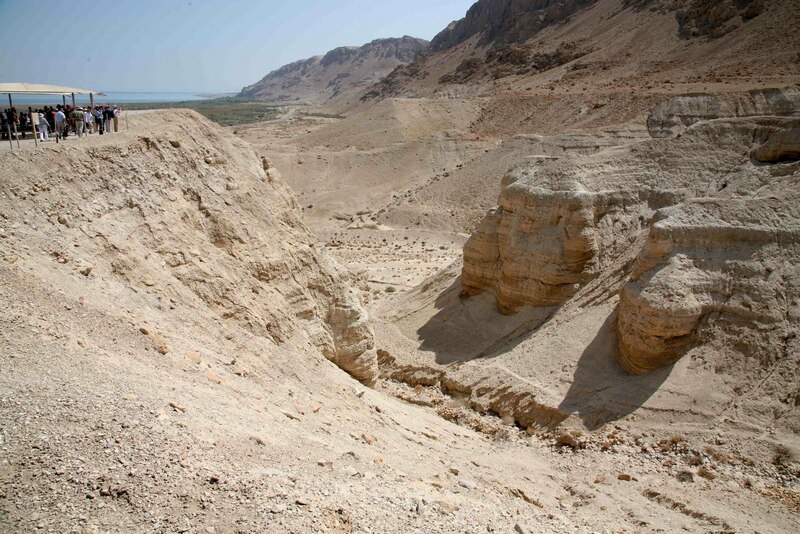 Geologists studying the region for many years have divided the history of the Dead Sea Valley Rift—also called the Jordan Transform Fault—into three main stages. 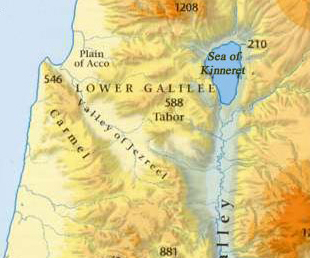 First, the rift began to form a valley, but that valley maintained an intermittent connection to the Mediterranean Sea through the Valley of Jezreel. For a long time—one to two million years—water from the Mediterranean flowed intermittently—as sea levels rose and fell due to ice ages—into the Jordan Valley where a huge lagoon formed. Continuous evaporation caused the water to become supersaturated with salt. At the same time, that salt water and sediment were pouring into this valley, while the valley floor was slowly falling due to the slow rifting apart of the valley. During especially hot and dry climatic cycles usually lasting thousands of years, the salts would have precipitated out of the lagoon waters and deposited at the bottom of what would have been an ever deepening lake. These layers of salt would have been piled on top of each other, eventually amounting to layers of salts and interbedded sediment layers over 10,000 feet thick that filled in the ever-widening crack in the earth. 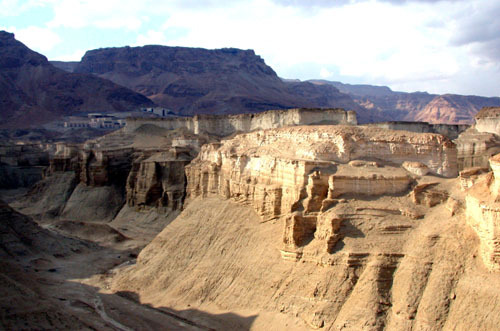 Later—about 1 million years ago—the Judean Mountains, west of what is now the Dead Sea valley, were gradually uplifted. This lifted the Valley of Jezreel, to the point that the water from the Mediterranean Sea was cut off from what was now a single 100+ mile-long salt water lake. That first lake has been named Lake Amora. Without a constant influx water from the sea and being a relatively arid land, the lake began to shrink. As it shrank, the salts would have become even more concentrated and deposited at a higher rate at the bottom of the lake. Eventually, the lake would have reached an equilibrium point, where the water coming in was equal to the amount evaporating. At that point, the lake would have stabilized with salt, which was gradually being added from river input and then precipitating and slowing adding more layers below this smaller lake. Again, the entire valley floor would have been continuously falling due to rifting. So even when the lake was at equilibrium its surface would have continued to fall further below sea level. Eventually the floor of the Jordan Valley reached greater depths as it continued to sink. With the Jordan Valley reaching the shape and size that is similar to what we see now, a much smaller lake was left in that valley. This smaller lake has been named Lake Lisan. Lake Lisan deposits at the Qumran caves. These layered rocks in the foreground represent sediments that were laid down during very high stages of Lake Lisan. Later this rock was eroded by streams cutting through the soft rocks. The flat spot people are standing is around 1000 feet below sea level which is 400 feet above the current lake surface of the Dead Sea. We know that such a lake existed because this lake left evidence in the form of thick lake deposits and ancient lake shorelines eroded into the sides of the Jordan Valley (see image above and below). Because lake deposits and shorelines of that lake have been identified, we can infer quite a bit about past lake levels. Think of it this way: water in your shower or tub leaves bathtub rings, which are marks showing you where the water levels were in the past for some sustained period of time. No lake in any terminal basin is ever completely static in elevation because the volume of water going in and coming out is always changing over time. If the climate becomes cooler and wetter, then more water will be deposited and less water will evaporate, causing the lake level to rise. If the climate turns hot and dry, the opposite will occur. If climates have changed radically enough, then we can expect to see evidence of lake levels rising and falling over time. The bathtub rings represent periods of relatively stable climates for hundreds of years, allowing for significant shoreline development as the water along the shore eats into the sides of the valley walls. This is exactly what is observed both in the present, recent past – in the last 2000 years – as well as the more distant past. The Dead Sea shoreline. White areas represent former shorelines of the recent past. Further up on the mountain side you can see ancient shorelines (faint horizontal lines) from when the lake was much higher. Dead Sea drainage area and the boundaries of the former high lakestand of Lake Lisan which filled the Jordan Valley in the distant past. How big was Lake Lisan? This prehistoric lake at times extended more than 100 miles all the way from the Sea of Galilee to below the current south end of the Dead Sea. Evidence from the sediments it left behind tell us that this lake shrank and expanded many times. Cores drilled from the bottom of the center of the Dead Sea – the deepest portion of the Jordan Valley – have revealed that there was a time when this lake disappeared altogether, or was perhaps just a tiny seasonal lake. At some point, the lake no longer expanded to its former range up and down the entire valley and remained more than 900 feet below sea level. This is where it has been during all of recorded human history, and we call that remaining lake the Dead Sea. What about the Sea of Galilee? The Sea of Galilee has only existed periodically during the life of the Jordan Valley. We know this because Lake Lisan often was high enough to encompass both the Dead Sea and Sea of Galilee. Each time the elevation of Lake Lisan dropped approximately 700 feet below sea level, a body of a lake similar to the Sea of Galilee came into existence. After the final drop in elevation occurred as the last Ice Age slowly came to an end from 20,000 to 10,000 years ago, the Sea of Galilee again appeared and has been remained to this day. Despite being 700 feet below sea level, the Sea of Galilee is a freshwater lake. Natural fresh water springs feed the lake and the Jordan River also carries fresh water into it. However, it has not always been a freshwater lake. Only a hundred feet or so below the bottom of the Sea of Galilee lies many layers of sediments that are composed of many forms of salt. These attest to the salt water history of the ancient Sedom Lagoon, connected to the Mediterranean Sea and to a lesser extent Lake Lisan, which deposited sediments here prior to the Sea of Galilee becoming a freshwater lake. The Sea of Galilee is therefore the end result of a long series of historical events that lead to its formation and maintenance today. What I have presented in the last two posts is the current understanding of the origin and evolution of the Dead Sea and Jordan Valley as determined by hundreds of researchers studying many aspects of the geology of this region. Numerous dating techniques have been used to establish the timescales involved in the formation of these geological features, most of which are tens, hundreds, or hundreds of thousands of years. The shrinking of Lake Lisan from a 100-mile long lake to what we see today is thought to have taken many thousands of years itself. And this occurred only after a period in which the lake fluctuated up and down for 50,000 years. These timescales do not fit with the young earth creation (YEC) view. The Dead Sea clearly contradicts the YEC worldview because nearly all the phases of the development of the Dead Sea must be crammed into an exceedingly short time frame of at most 300 years. Why 300 years? The first record of the Dead Sea comes in Genesis 13 when Abraham and Lot stand and look down on the Jordan Valley. All events recorded in the Bible and other literature of the time that take place after this – the last 4050 years – confirm that the Dead Sea was no lower than it is today and not more than 200 feet higher. So by the time that we have the first written record of the Dead Sea, it had obtained all the characteristics that we observe today. Thus the series of events that lead to its present appearance must have all occurred prior to this time. But in the YEC view, a global flood covered the earth just 4350 years ago. Consider also that when Abraham looked into the valley, there were already several cities well established there, and so Lake Lisan would have to have shrunk to the size of the Dead Sea today sometime well before Abraham arrived in the region. We will be looking at and critiquing this young earth view in the next couple of posts, as we look at some young earth interpretations of the Dead Sea sediments. 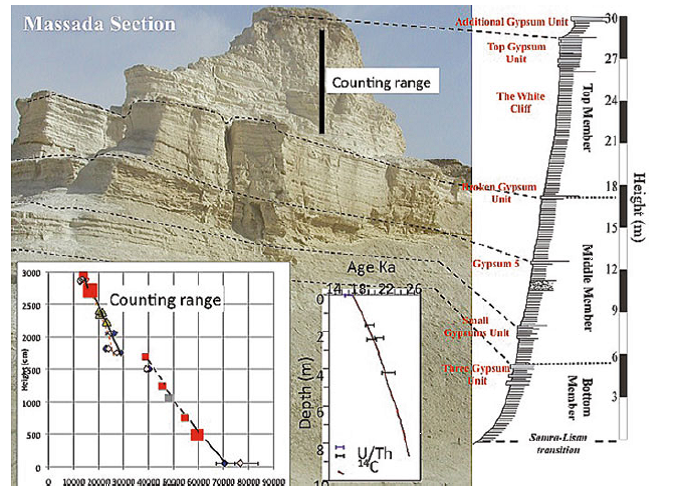 Dead Sea Transform fault System: Reviews Series: Modern Approaches in Solid Earth Sciences, Vol. 6 Garfunkel, Zvi, Ben-Avraham, Zvi, Kagan, Elisa (Eds.) 2015. This is a fantastic volume from this year that summerizes research on the Dead Sea fault system. It has articles covering everything from recent water level history to the long-term evolution of the Dead Sea to the record of earthquakes. “Judean Mountains, east of what is now the Dead Sea valley,” – Should this be west of the Dead Sea Valley. What do you say about the Genesis 1 terminology that makes the Earth different from the “earth” in that chapter? The “earth” in Genesis 1 is actually the dry land that stood up (uplifted?) from the watery globe surrounding it. Heaven, or atmosphere, was a space made by condensing the lowest, densest levels of the existing atmosphere. It gives me the impression that Earth looked like Neptune does–a rock core the size of Neptune’s, with a watery mass extending from the rock/metal surface to its outermost boundary, getting less dense in the gas. This description of Genesis 1 lends itself to an old earth history. The young earth would refer to the planet after its modification by the Creator and the developments of creation from the third day to the sixth. The giant gas orb would have existed for who knows how long as what might be a “rogue planet”, which was omnipotently moved to our star, Sol, on the fourth day (for the lack of any other explanation for a Sunless 3 first days of Genesis 1). If I read your article right, the Dead Sea disagrees with YECs, and probably even my amateur/non-theological interpretation of Genesis 1. Is it possible that there could be some agreement between my semi-scientific creationist ideas and the Dead Sea geology?